The #1 New York Times–bestselling story about American Olympic triumph in Nazi Germany, now in a premium mass market edition. 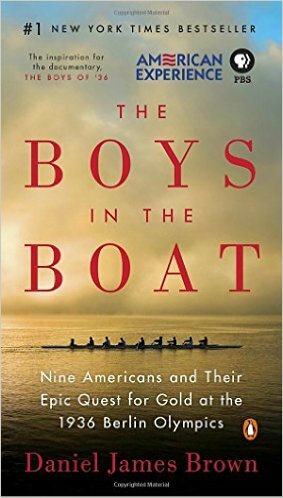 Available just in time for The 80th anniversary of the boys’ gold medal win as well as the 8/2 broadcast of the PBS /American Experience documentary, The Boys of ’36. and the start of the 2016 Summer Olympics. 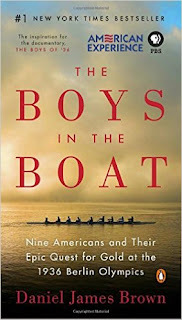 A friend recommended this book to me and although I didn't think I would be terribly interested (not a sports fan) it got good reviews and I was into watching the Olympics this year.... and I needed something to listen to on my drive home to the Florida Keys from NC. (Note: I love Audible.com) I immediately got so pulled in to this story that when I finally got home I sat in my car and continued to listen. Learning what these boys went through to compete in the 1936 Olympics was inspiring. Daniel James Brown did such an excellent job of making you feel the heartache and enthusiasm of these boys at a time when families were experiencing the hardships of the Depression and Germany was doing its best to influence the world under the leadership of Hitler. Wow! I heartily recommend reading this book!